Plaza Food For All has been a very successful cafeteria formula for 15 years. The company now has around 80 locations throughout the Netherlands, several of which are in the Cafeteria Top 100. More and more cafeteria entrepreneurs are joining this formula to take advantage of national fame, professional marketing, food concepts and above all: maintaining your freedom. Plaza Food For All wants to create a uniform brand image nationwide and also wants to give entrepreneurs the tools to quickly and easily set up local marketing campaigns. In addition to booking the national campaigns 12 times a year, the entrepreneur must also be able to quickly and easily set up local campaigns. We built a Marvia environment in the corporate identity of Plaza Food For All. In this portal, the franchisers can order their monthly campaigns. 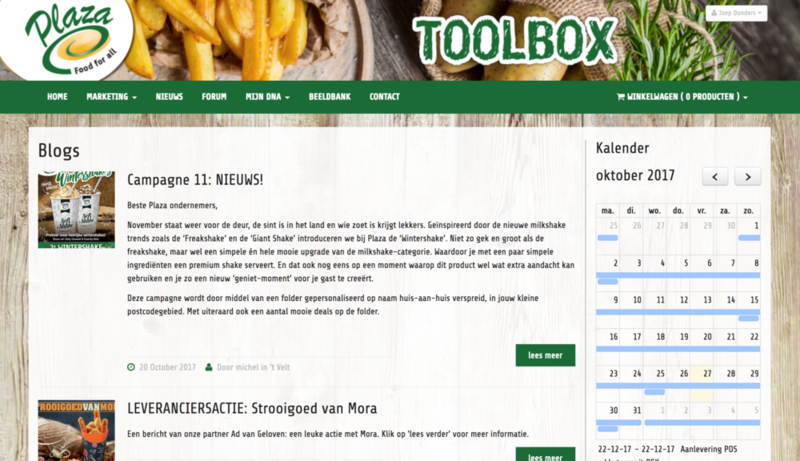 Also, the toolbox also offers the possibility to create local campaigns, for both online and offline channels. The portal also serves as a communication platform to, for example, share knowledge or enter into dialogue with each other through a forum. A reporting facility has been built in for management to keep control over marketing expenses. Curious? Read more stories from our satisfied customers.